"This is it. You're in your hell, and I'm in mine." MPAA Rating: R for some strong sexuality, and for language. "Simpatico" is a Spanish term meaning, roughly, friends on the same wavelength; it implies a special kind of mental or emotional bond. Not surprisingly, the central characters of this film, adapted from a Sam Shepard play of the same name, display this special bond. 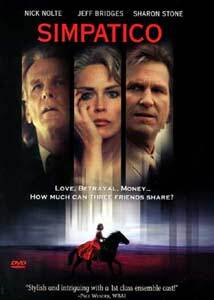 Vinnie Webb (Nick Nolte), Lyle Carter (Jeff Bridges) and Rosie Carter (Sharon Stone) were involved in a scam some twenty years ago, but the bond between Vinnie and Lyle hasn't dissipated, even though they rarely talk and now travel in completely different circles. Vinnie is a dissolute, near-street-person who plays at being a private detective in California; Lyle is a player in Kentucky thoroughbred racing, owner of a Triple Crown winner, the fictional horse Simpatico. Vinnie calls Lyle, claiming an emergency and being vaguely threatening about spilling the beans to the police unless Lyle comes out to help him. Even though Lyle is in the midst of a $30-million deal to sell Simpatico, he hops a plane to California. Though ostensibly there to help Vinnie, Lyle seems most interested in the whereabouts of some negatives of incriminating photographs. Lyle cleverly takes advantage of this interest to leave Vinnie high and dry in California while he himself heads to Kentucky to peddle his wares to the highest bidder. The magic of this film in a great part rests on the bond between these two, and how eerily they are able and willing to slip into the habits of the other one. Vinnie gets himself cleaned up, with the help of Lyle's credit cards and wad of cash, turning into a virtual suited clone of Lyle; in the meantime, Lyle becomes increasingly dissolute and ultimately ends up looking like Vinnie at the start. The casting of Bridges and Nolte is inspired, for their slight resemblance is used to good advantage in this film, with each actor taking on the persona of the other. Their very identities are thus shown to be utterly fragile, tied intimately to their money. The other vital tie between Lyle and Vinnie is their love of Rosie; Sharon Stone gets second billing but she doesn't even appear in the film until it's two-thirds over. She does a great job of portraying the beauty gone to seed from too much drink, pills and guilt. When Vinnie finally confronts her to suggest that she run off with him, she pulls off a tour de force performance that has genuinely convincing emotion behind it. And of course, looming in the background is the ever-precarious sale of the horse, Simpatico, despite Rosie's affection for the horse; Lyle's willingness to sell the horse nonetheless helps underline the distance between Rosie and Lyle, giving Vinnie's proposition tragic proportions. I found it difficult to believe that this film was adapted from a stage play; it seems so utterly cinematic, full of images which at first seem meaningless but which ultimately have vital importance, that a staged version seems hardly possible. This innately cinematic nature is reinforced by a series of flashbacks to the events of twenty years earlier, which by the end give the viewer a picture of what exactly transpired and what it has done to these three characters. Three young actors (Shawn Hatosy, Liam Waite and Kimberly Williams) do a good job of conveying these characters in a younger, more vital, but hardly more innocent time. An interesting drama that rewards a second viewing to pick up the clues and references dropped along the way. Image Transfer Review: The anamorphic image is subdued in color (except in the flashbacks, which are more colorful, just as if a memory is more colorful than real life), but has good blacks and excellent shadow detail. Many scenes take place in harsh, contrasty lighting, but they come through well, without washing out the highlights or losing detail in darkness. Skin tones are good. Artifacting is practically nonexistent. This isn't a flashy picture, but it does the job. I didn't see any defects in the source material at all. The P&S picture on the fullscreen side loses significant picture information, especially during the racetrack and paddock scenes, and thus is not recommended. Audio Transfer Review: The DD 5.1 track is mostly center-oriented. The surrounds are used for subtle atmospheric effects, such as bar noises and crickets in a field. Stewart Copeland's musical score is subtle to the point of nearly being invisible; this would have been a good disc to have an isolated score, since the dialogue-heavy film tends to cover much of the music up. Background hiss is minimal. Extras Review: We get anamorphic trailers for this film as well as Mother Night (which is a sort of Easter Egg, buried in the Nick Nolte filmography). The only other extra is a set of full filmographies lifted (with credit) to the IMDB. These filmographies cover Nolte, Bridges, Stone, Hatosy, Waite, William, Catherine Keener, Albert Finney, Sam Shepard and director Matthew Warchus (whose first film this was). Chaptering is plentiful, and the subtitling is generally accurate. A little more than barebones, but not much. An interesting character study and drama, given a quite good transfer. Some powerful performances by the principals and the supporting cast make this a disc worth a look for anyone seeking serious, thoughtful drama.